This book features 60 delicious recipes from a unique and vibrant cuisine. 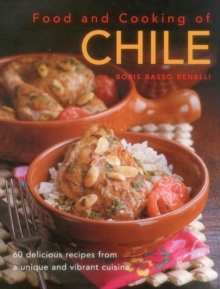 It is a celebration of Chilean food and cooking, with authentic and tempting recipes that are easy to recreate in your own kitchen. Recipes include traditional Empanadas, stuffed with beef and olives; Picorocos Gratinados, a piquant dish of seafood topped with cheese; and Leche Nevada, a dessert of soft meringue floating on a delicate custard. It is lavishly illustrated with beautiful photographs of every dish, and easy-to-follow step-by-step instructions. Chile enjoys a privileged position in South America, with a diverse climate and geography that hosts a wide variety of ingredients, from fabulous seafood to grass-raised cattle, and an amazing variety of fruit and vegetables. Chile's cuisine is deeply rooted in its past, with a successful fusion of indigenous foods, such as potatoes, corn and quinoa, with traditional Spanish cooking techniques brought to the region by the conquistadores. The recipes in this book are full of taste and individuality, with fritters, dumplings and salsas to whet the appetite, hearty stews and tender fish dishes as main courses, and luxurious creamy desserts.